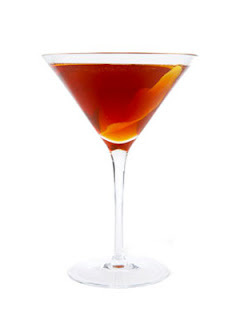 The Manhattan is a classically cool drink and is often referred to as the Cary Grant of cocktails. It was created for a party at The Manhattan Club in 1874. According to Hemingway and Bailey's Bartending Guide, Lady Randolph Churchill (that would be Winston's mummy) took the first sip, lifted her glass and toasted, "To Manhattan". Pour bourbon, vermouth and bitters into a mixing glass filled with ice cubes. Stir well. Strain into a chilled martini glass and garnish with cherry. I do enjoy a good Manhattan on occasion, but only one as more than that and I am in trouble! That said, being that it is Thursday and it has been a long week, let's join Mrs. Churchill is saying, "To Manhattan". Cheers! This entry was posted on 4:11 PM and is filed under cocktails , The Manhattan . You can follow any responses to this entry through the RSS 2.0 feed. You can leave a response, or trackback from your own site. I think I'm going to have join you for a drink, because it's just been one of those weeks! I think you're someone I would adore knowing. You certainly have a gracious & lovely spirit. A Manhattan is a great way to feature bourbon! Living in Kentucky, I must say I was SO excited to see the bourbon love on this post! ;) Have you had an Old Fashioned? "They" say it was created at the Pendennis Club in Louisville. Hi theluckiestmrs! I too like a good Old Fashioned, another classic bourbon drink! Like you and Mint Juleps and Magnolias, I also hail from Kentucky and share in your bourbon love (It's Woodford at our home). Have a great day! I like this story!! And i would enjoy a good Manhattan right now (in Manhattan if possible :-) Have a nice weekend! As my maiden name is Churchill, I guess I better have a Manhattan this weekend to toast the Mrs......a good enough reason, is it not? I love the history of the "To Manhattan.." story....fantastic! A cocktail with Cary Grant in Manhattan....a girl can dream!!! What a date that would be! I've never had a Manhattan....I might have to coerce MDH into taking me out for cocktails this weekend. I love these (only 1) during the holidays - they remind me of when my Mom would come to visit me in Manhattan during the holidays! They are so festive and pretty! Enjoy.... Have a wonderful weekend, xv. I would love one of those. Have a great weekend. Cheers! I haven't had one in ages...will try this weekend!